Ok so I love Roy Orbison. Was thrilled about his comeback and saddened by his death.His new arrangements and gentleness had brought him new listeners. Cyndi does a great job with this tune. A feminist of the second wave. It is a strange thing to be old enough to remember when there was a woman’s movement. Not little undulations but a wave that rose and washed down on my generation. I am a product of the second wave. What then of the third wave? Will it find solidarity with my generation while remaining dynamic and responding to new circumstances? I will happily be swept up into the third wave just call on me. I will hear my sisters. Stumbled upon this on YouTube. Joni Mitchell’s version of this song is seared into my memory. Yet this version has touched me and now I have embraced it’s slow deliberateness. Enjoy. I am fighting with every last bit of technology today. It started with finding out that a number of WordPress blogs had been hacked. What a mess. Hours spent cleaning up that mess and still haven’t had the time to reinstall all the plugins. Laptop was being a little weird so I just closed the lid and am at my workstation today. Ok. All I can say is thank-you Dropbox. 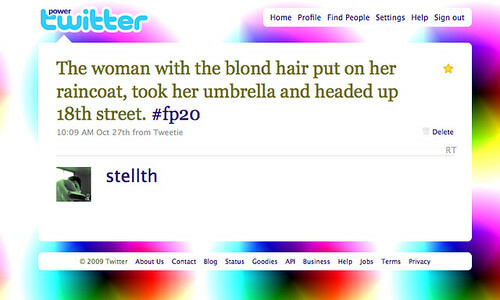 This is a capture from my first tweet in Following Piece 2.0, a global collaborative art project as part of @Platea. I’ve written a recap of my experience participating in the project. and you can find it at : the @Platea blog. I have been working on an online book of the project and expect to add more thoughts here and at my ARTlog. I hope you’ll check back on the project and leave your thoughts about the work. It was an exciting experience. Forty years ago, in October 1969, artist Vito Acconci performed Following Piece. A study in the public spaces we occupy and assumptions around privacy, Acconci followed random people in Manhattan during the month and reported on their activities until they entered a private area such as an apartment or car. And so, with that in mind, I thought it might be fun to do a cover of Following Piece, but to look at it specifically in the contemporary context of Twitter, a world where public/private boundaries are shifting and eroding, as once-private activities are broadcast into online public space. In the world of Twitter, the idea of following has taken on a new meaning: once an uncomfortable thought, it’s now regularly seen as a good thing to have one’s private actions followed by many strangers.